While little sis Kylie Jenner is on pace to be a billionaire, at least according to mama Jenner, Kim Kardashian is on a mission to expand her own KKW Beauty range. 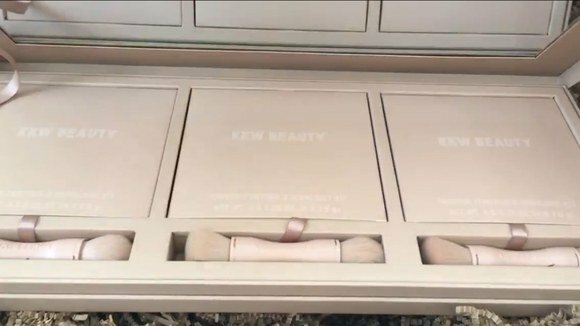 She has already drummed up hefty sales (though apparently not of the Kylie level) with her now sold-out Crème Contour and Highlight Kits, so it’s not surprising that Kim is teasing a foray into powder kits. KKW Beauty has clearly become Kim’s latest obsession as she even introduced her brand into her Kim Kardashian: Hollywood game. Yes, you can actually virtually accent your avatar’s face with her creamy contour kit. And it seems only natural that when the powder kits are released, those will also get worked into the game. Clearly, Kim is trying to give Kylie a run for her money in the makeup game. Only time will tell which Kardashian will reign supreme.